Lassonde School of Engineering founding dean Janusz Kozinski presents the Renaissance Engineer of the Year Award to Datawind’s Suneet Singh Tuli. The founder of Datawind Inc, a British-Canadian company with an operations headquarters in Amritsar, was recently awarded a unique engineering award by a Canadian university. 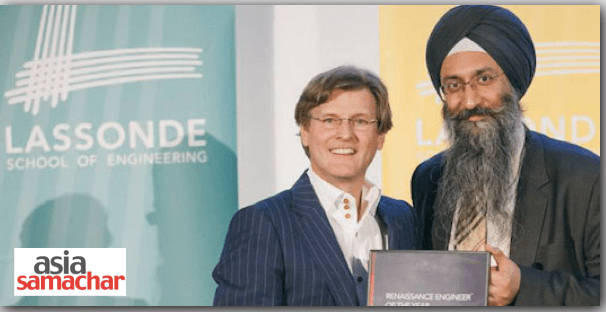 Suneet Singh Tuli was conferred the Renaissance Engineer of the Year Award by Lassonde School of Engineering at York University at its inaugural award on May 1. The award is conferred to an individual that exemplifies the Renaissance Engineer in pursuit of greater prosperity for all, according to a statement. Datawind, listed on the stock exchange of Toronto, Canada, shot to fame some years ago when it developed for the Indian government the Aakash tablet, dubbed as world’s cheapest tablet. Badging itself as a leader in low-cost internet connectivity, Datawind makes what it says are the world’s most affordable tablets, phablets and smartphones. It has also patented technology that allows for faster and and more affordable experience on existing networks without any new infrastructure. “It gladdens me to note that DataWind’s breakthrough technology and approach to bridge the digital divide has been recognized as a modern day Renaissance in creating greater access and connectivity for the forgotten billions,” said Suneet, the company’s President/CEO, in the same statement. The engineer of the future no mere problem solvers or functionary builder, but also eager to consider and communicate how engineering relates to matters of sustainability, health, safety and civil society. “You are an engineer, but at the same time you are an artist and you have to be able to tell the world how what you’re doing is going to benefit the world,” he told The Globe and Mail in an interview in 2011. Founding Dean of Lassonde School of Engineering, Janusz Kozinski presented the award to Suneet Singh Tuli in presence of Lassonde.